Webster University President Elizabeth (Beth) J. Stroble and Anne Geraghty-Rathert, professor of legal studies in Webster's College of Arts & Sciences, were among four women honored with Golden Lane Awards by the Metro St. Louis League of Women Voters as part of its “Celebrate the Vote” festival in downtown St. Louis. This year's festival had particular significance, as it marked the 100th anniversary of the "Golden Lane" demonstration at the Democratic National Convention in St. Louis, when women organized to lobby to include women's suffrage in the party platform. 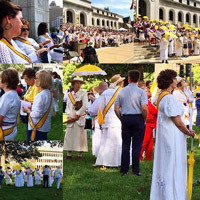 Attendees wore white and carried golden umbrellas and sashes to re-enact that protest a century ago. The original event in 1916 created a "golden lane" of a reported 3,000 protesters walking down Locust Street. That was just a year after Webster was founded near St. Louis, initially as a college for women before they even had the right to vote. "We come together today to recall the women who showed enormous resolve and a persistence of spirit," Stroble said at the event. "That persistence of spirit has been the mark of every generation of advocates for civil rights, including the right to vote." Stroble was honored as a female leader in higher education -- one of the few female presidents of four-year colleges -- who has advocated for women's initiatives at local, national and international levels. Geraghty-Rathert was honored for her social justice work, including the WILLOW Project, (Women Initiate Legal Lifelines to Other Women) a nonprofit that provides legal assistance to society's forgotten women. A practicing attorney, Geraghty-Rathert represents women who cannot fully access the justice system, because of poverty, oppression, exploitation, and other injustices. Local news covered the festival. Read more at St. Louis Public Radio and KMOX-AM Radio.